Declan Duffy, 36 anni, è stato condannato all’ergastolo per l’omicidio di Michael Newman, 34 anni all’epoca dei fatti, sergente del British Army assassinato dall’INLA il 14 aprile 1992 nel centro di Derby. Il repubblicano, portato in Inghilterra per rispondere delle proprie accuse, si è dichiarato colpevole di omicidio dinnanzi alla Stafford Crown Court, nell’udienza di giovedì 22 luglio 2010. Condanna a vita per Declan Duffy, che dovrà trascorrere obbligatoriamente 24 anni dietro alle sbarre. Duffy che era stato indagato ad altri due membri dell’INLA, lo scorso anno aveva dichiarato di voler collaborare con la polizia dopo aver scisso ogni suo legame con il gruppo paramilitare repubblicano. “Non avrei mai parlato con la polizia in passato, ma la mia guerra è finita e ci sono cose che devo togliermi dallo stomaco”, ha dichiarato Declan Duffy aggiungendo: “Era un uomo di famiglia ed è un peccato che sia stato ucciso”. “Sarei felice di incontrare un membro della sua famiglia per spiegargli le circostanze per cui i soldati in quel momento erano nel mirino”. “La guerra è finita e riconosco il male causato ai cittadini irlandesi e inglesi». An Irish republican terrorist has been jailed for life after he admitted the murder of a British soldier outside an Army recruitment office 18 years ago. Sergeant Michael Newman, 34, was gunned down by the INLA, an IRA splinter group, in Derby city centre on April 14, 1992. Declan Duffy, 36, who was brought to England from Northern Ireland to face the charge, pleaded guilty to murder when he appeared at Stafford Crown Court on Thursday. He was jailed for life with a minimum tariff of 24 years. The INLA, which announced it was disbanding last year, admitted responsibility for Sgt Newman’s killing at the time and even wrote to his family explaining that he had been shot as part its fight with the British government. Duffy, a former leader of the group who was named as a suspect along with two other INLA men, said last year he had decided to speak to the police after renouncing his links with the INLA. He added: “This man was a family man and it is regrettable that he was killed. “I would be happy to meet with any member of his family to explain to them the circumstances of why soldiers at that time were being targeted. Duffy, who was jailed in Ireland last year after admitting INLA membership, also claimed his decision to renounce links with the group had led to him receiving death threats. Fellow INLA member Joseph Magee was jailed in 2004 after pleading guilty to Sgt Newman’s murder. 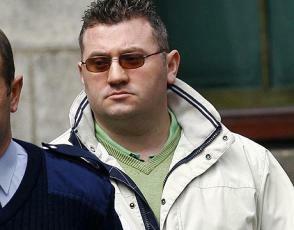 Anthony Gorman, who is also accused of the shooting, is fighting extradition from the Irish Republic.